When Nick Mason made comments in Italy about heading out to small venues, to play early Pink Floyd songs, few took the remarks seriously. As unlikely as it seemed, Nick was entirely truthful and in the initial announcement a set of four shows in London were announced for his new band. Nick Mason's Saucerful Of Secrets brings together some familiar names, all great musicians: joining Nick are Gary Kemp and Lee Harris on guitar, Guy Pratt on bass, and Dom Beken on keyboards. Kemp is best known for his work with Spandau Ballet, Harris as having played guitar with The Blockheads (Ian Dury's band), Pratt needs no introduction, and Beken is principally known for his work with The Orb, and Transit Kings (with Pratt). 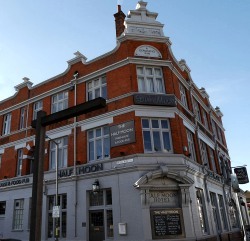 The band will be playing early Pink Floyd songs. This is a unique opportunity to experience Pink Floyd's celebrated and significant early body of work played live including songs from albums 'The Piper At The Gates of Dawn' and 'A Saucerful Of Secrets'. The regular sale of tickets started on TUESDAY, APRIL 17th at 10am (local time), via TheSaucerfulOfSecrets.com. Inevitably the tickets sold out almost instantly. All ticket holders will require photo ID with their ticket for entry to the shows. MAIN SET: Interstellar Overdrive, Astronomy Domine, Lucifer Sam, Fearless, Obscured By Clouds, When You're In, Arnold Layne, The Nile Song, Green Is The Colour, Let There Be More Light, Set The Controls For The Heart Of The Sun, See Emily Play, Bike, One Of These Days. ENCORE: A Saucerful Of Secrets, Point Me At The Sky. 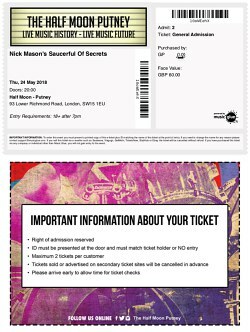 This review of the fourth and final night of Nick Mason's Saucerful Of Secrets "global tour, playing both Camden AND Putney" (as Nick amusing put it) should be read in conjunction with the review of the first night at Dingwalls. Most of the comments within that, apply equally to this show. Rather than repeat ourselves, if you've not read that one, scamper over and take a look now. Night four of four - a quartet of shows that would surely remain with those in the audience over the years, being at the start of something very special indeed. At this stage, there were less in the audience unaware of the set list, or of the highly critically acclaimed performances, and the queue outside the performance room was full of slightly hushed discussion of the previous nights, notes being compared, intrigued newbies quizzing those who had been to one or more of the other shows. Seemingly a warmer night still, early summer temperatures rising nicely, but this did make things rather hot in what seemed a very cramped performance room at the Half Moon. Whilst the first night in particular seemed to have the most chilled crowd, giving everyone space, this final night did seem to have a large contingent keen to get as close to the tiny, wedge-shaped stage as possible. Still, all very good natured! The beginning of the show brought a storming trio of Interstellar Overdrive, Astronomy Domine and Lucifer Sam, before Nick and his now customary introduction. Before we mention that, I wonder if anyone else noticed a small bit of The Embryo had been subtly sneaked in to Interstellar by Harris? It worked really well in the context of an improvisational section of the song, and wouldn't it be great to hear the band do the whole thing? Echoes has had a number of outings in recent years, of course, and David Gilmour won't perform it any more, called it a "conversation between two friends" (he and the late Richard Wright) but The Embryo hasn't been performed since November 1971. I'd be fascinated to hear Nick's new band tackle it. Alternatively might we hear similar musical "easter eggs" like this in future performances? From the word go, it seemed like the band were in the best form of all the four shows. Tight, powerful, comfortable with each other in the live setting, and comfortable with improvising around the central themes in songs which suited exploration. How often have bands gelled so well together, so soon? You could sense an unspoken understanding between the musicians, occasionally looking at each other as sections were explored with an innate and instinctive feel. From the delicate playing of Fearless, through the Moog-esque opening of Obscured By Clouds (as the Floyd themselves started this song in concert, in a departure from how it sounds on the record), to the "metal Floyd" stylings of The Nile Song, each selection in the set hits the spot. This is no tribute band - the Saucers have taken the material and seem to have made it their mission to bring the sound of the Floyd in their early days back to the fans. Nowhere to be found are starchy recreations, the same night after night; the Saucers instead show a finesse and style where even the odd, early performance fluff isn't an issue, but just something to work around. So, show four done, the final night of this first jaunt for a member of Pink Floyd and his truly excellent new band. The morning after the night before, of course, we found that this was all just a taster (as expected) for a full tour, and if you haven't already checked them out, our news page - and the Nick Mason's Saucerful Of Secrets 2018 section here on BD - have all the dates and details. Tickets are on sale now and unsurprisingly selling very quickly. If you have an interest in Pink Floyd's music (and you must do to be reading this!) go with the positive reaction across the board from those lucky enough to have been at these four shows, and snap up your tickets for September! Back to this particular show though. We'd love to know from those attending how they felt the concert went. How was the show for you, if you were one of the fortunate ones to attend? Let us know what YOU thought! YOUR HELP NEEDED! We want to cover Nick's concerts the best we can, to share the experience with everyone, especially those who won't be able to attend the shows. We'd love to see ANY pictures, tickets scans, reviews, newspaper reports, and anything else you come across for this show - we look forward to hearing from you!